On the 25th I got a visit from RVSue and her Canine Crew. I guided her to a site where she could have lots of sun for her solar panel and also be able to make use of my Internet connection. I had my regular work to do during the day but once that was completed I was able to sit down and talk over a glass of wine. I had originally met Sue at the Elephant Butte SP outside of Truth or Consequences, NM. We were able to talk about all our wonderful adventures on the road. I do read Sues blog so I have an idea where she has been, but it was still fun hearing about it from Sue. Of course the crew was there and made plenty of noise whenever I would come over to see them. She stayed three nights and just left yesterday morning. It was my day off and I was going into Prineville for food and especially propane (as I was almost out) so she felt it was a good time to leave. I showed her several campsites I have camped at. She is headed toward the coast and wanted to get there before the weather gets too cold. This is a pic of Bridget, one of Sue’s canine crew following the GPS and ready to make a left turn. No Bridget not a left into the forest! Click on the pic and you can see Bridget behind the wheel driving like a maniac. There goes RVSue and the Canine Crew off to the coast for more exciting adventures. Thanks Sue for stopping. It was a fun 3 days. It is always nice meeting fellow bloggers and friends on the road. 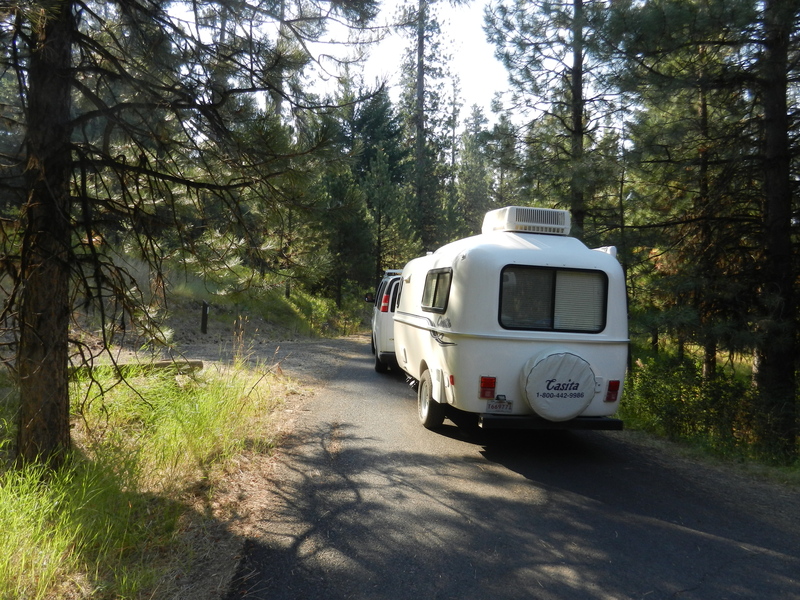 This entry was posted in My Friends, Ochoco Divide Campground, Ochoco National Forest, Oregon by Jim Melvin. Bookmark the permalink. Spike was pouting in the back seat because he was leaving his buddy Jimbo behind. We’ll be heading up to Crater Lake then Bend and back East to Indiana. We’ll be in Oregon on 9/8-9/9. I wish we could head up the mountain to see you but it’s not really along the way. It’s so nice to see you two meet up, Sue and you are both so interesting, the highlight of my day is to receive a blog notice from you two. Pics are beautiful, can’t wait to get out there myself. Sounds like you had a nice visit with Sue and the Crew. Fun times. Hi, Jim! What a great job you did writing about the time we spent as neighbors. 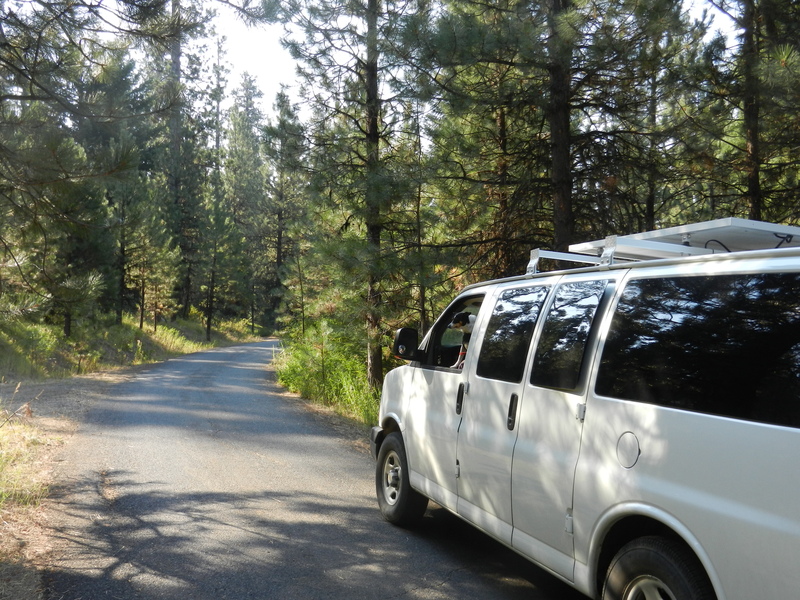 I stopped at Paradise Campground and you’re right… It is beautiful! Unfortunately it was packed with campers, so I kept going and managed to find another campground next to the McKenzie River. That pic of Bridget driving … I clicked on it to see better … what a hoot! My only question is whether Bridget has a license?